Starting something on a Wednesday is totally weird for the OCD in me. Also weird; this skirt totally shrunk in the last couple months. Cuz those pumpkin spice lattes are fat free right? Wait- what???? Also crappy: I can’t take a decent picture in the mornings because the lighting blows and I’m incompetent about camera settings. This shirt’s already unraveling. And I have cramps. Awesome start. Lookin’ hot. 🙂 I am excited to see how this goes. I am sure you will rock it as always. thanks chick! it’s totally dorky, huh? but fun. I think you look great. And that belt is the bomb. 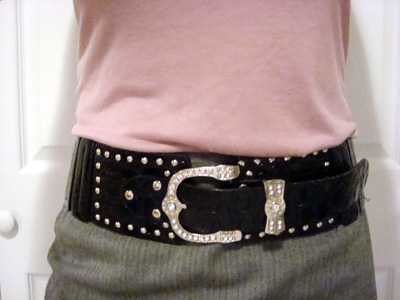 Love the belt & the top & now I REALLY need a pumpkin spice latte….